If you haven’t gotten your FREE copy of my book, Why You Need A Writing Mentor, kindly visit any of the Amazon stores and search for the title. This offer goes upto 8th June 2012 only. Hurry! Get your copy now! 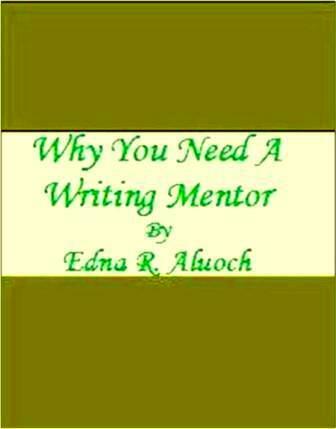 Why You Need a Writing Mentor is an ebook about the need fo r writers to be mentored, especially for those who are just starting out on their writing career. It highlights the various ways in which mentoring can take place, how to recognize a good mentor and the benefits of being mentored. The book is already available on Kindle at all Amazon stores. If you visit any of the Amazon stores and look for the book between 4th and 8th June 2012, you will be able to get a FREE COPY! It is my way of saying “thank you” to all my supporters on this blog. You guys are great! Don’t miss your chance of getting a free copy of this valuable resource for writers. I would also appreciate your take on the book – what do you think about it? You can give your opinion in the comment box below. I have just published my first e-book entitled Why You Need A Writing Mentor. It is already available on Kindle at the Amazon Stores. Please check it out at Amazon and click the ‘like’ button. Buy yourself a copy and let me know what is your opinion.